Jason Absmeier, piloting the #90 Trigon Revlimit Racing car, won his second race of the 2015.1 SA simSS3 Series at Monza. Starting from pole position, Absmeier immediately came under attack from Gabriel Rossouw in the #25 Trigon Revlimit Racing Junior Team car. With a better run into the opening corner, Rossouw passed Absmeier under braking. Absmeier in turn enjoyed a better drive out of the same corner to regain the lead before the following turn. Peter van Vuuren in the #15 car also managed to pass Rossouw. Later and after a spin at Ascari , van Vuuren was forced into retirement. This promoted the two HRTs of Mark Henebury and Chris Heyneke to third and fourth position respectively. 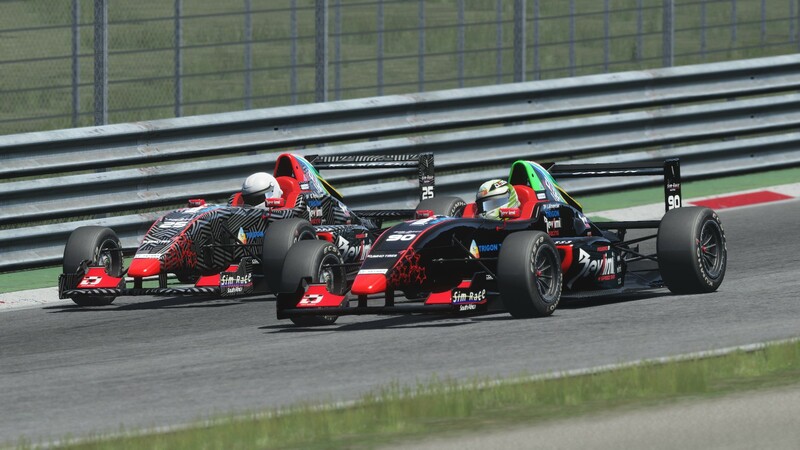 Henebury, with the absence of championship leader Basheer Jadwat, needed to do well at Monza to keep his chance alive of securing the drivers championship come Round 6 at the Nürburgring. After dazzling the timing sheets and catching the two front runners, Henebury suffered a big blow in the form of a spin at Parabolica. Henebury eventually rejoined the track, albeit well down the order. For the most part, all eyes were on the battle for the race lead. Lap by lap, Rossouw edged towards Absmeier. Rossouw seemingly had the better braking setup however a lower downforce setup enabled a better top speed for Absmeier. Towards the end of the race Rossouw had closed the gap to within just 0.15sec from Absmeier. The valiant effort from Rossouw would prove not enough as Absmeier went on to secure his second win of the season. Henebury fought his way back up the field to secure fifth position behind H-J Motorsport’s Jason Holden-Jones and teammate Heyneke. The Drivers Championship now sees Jadwat with a three point lead ahead of Holden-Jones and a six point lead ahead of Heyneke.